Most people are familiar with the concept of bankruptcy. Creditors are owed money, assets are liquidated and the liquidation proceeds are paid to creditors. The process is usually very difficult for the person filing bankruptcy as his/her assets may consist of a family home or a cottage, which possibly has been in the family for generations. The disruption can be devastating for the family and their children. The Bankruptcy and Insolvency Act (BIA), the federal statute that governs bankruptcy and restructuring in Canada, provides an option other than bankruptcy. The BIA allows an insolvent person whose aggregate debts are less than $250,000 (not including mortgages on residential property) to file what is known as a “consumer proposal”. A consumer proposal is not the same as bankruptcy, even though they are both governed by the same laws. A consumer proposal is a formal settlement between a debtor and his/her creditors of all unsecured debts for an agreed upon amount. The settlement does not have to be for the full amount of all debts but can be for a fraction of the total owed. The debtor makes one monthly payment to the administrator of the proposal, who in turn makes dividend payments to the creditors. More specifically, a person who is unable to meet their monthly debt payments meets with a qualified professional, who administers consumer proposals, and they discuss the ability of the debtor to make monthly payments. Together, they review the monthly income and expense statement of the debtor, as well as his/her net worth, to determine how much the debtor is able to pay each month. Once a monthly amount is determined the administrator notifies the creditors and helps to finalize a settlement agreement between the debtor and the creditors. Fifty percent (in dollar value) of the creditors must vote to accept the proposal for it to become binding on all. The main difference between a consumer proposal and a bankruptcy is that in the case of the proposal the debtor’s assets are not liquidated. The debtor receives the same protection from creditors and collectors but retains control of his/her assets. The two obvious benefits are that there is no loss of assets and no family disruption. three of them, the remaining two are not forced to settle. They can still pursue you for the amounts they are owed. In a consumer proposal, all creditors are dealt with together and receive the same payment plan. As consumer proposals are governed by federal law, any settlement is enforced by the courts and creditors are required to accept the settlement in full and final satisfaction of all debts. So the debtor gets to keep his/her assets, he makes monthly payments to satisfy all debts over time and the creditors receive payments, which are greater than what they would have received if the debtor had filed bankruptcy. consumer proposals. This is up dramatically from ten years ago when the majority filed for bankruptcy, having had no knowledge of the alternative. In today’s economic environment, it’s important that people know what options they have to deal with debt. Canada’s insolvency laws mean that today, “Proposals are not just for marriage anymore”. Association of Insolvency and Restructuring Professionals. Connect with Todd at: 416.963.7198 or todd.howell@crowesoberman.com. This article was originally published in Crowe Soberman’s quarterly business newsletter – Comments and is intended for clients of the firm. inTAXicating has been granted permission to repost this article solely for informative purposes. Should you require any assistance, we encourage you to contact the author(s) toll free at 1.877.929.2501, or in the GTA at 416.929.2500. I’m sure you have heard that the Canada Revenue Agency (CRA)is tightening the ship and cracking down on tax evasion, tax shelters and finding new ways to collect more tax dollars. Well you can thank the IRS for that. With the IRS predicting that there are billions and billions of dollars of offshore tax revenue that they expect to bring in through FATCA it’s no wonder revenue agencies throughout the world are looking at better ways to collect tax revenues from their citizens here and abroad. Riding the wave of FATCA, the CRA has been making public information on ways they can collect tax revenues and highlight some techniques they have been using as far back as when I worked in the CRA but may not have been so widely known to the general public. The point is that if you know all the powers the CRA has, and know they are cracking down, then you can conclude pretty quickly that you will get caught doing whatever you may be doing that is illegal; not remitting or reporting GST/HST, accepting cash for work and not reporting it, paying an employee under the table, not declaring all your income or just not filing and hoping to stay under the radar. The CRA’s Snitch line / Informant Leads line has been a fantastic resource for the CRA and has brought in more leads than they ever could have anticipated when creating this line. So what is the CRA doing that you might not know about? The CRA can, and have been data mining publicly available property tax information to confirm that sales or transfers of real property have been properly reported by taxpayers and they are using this information to identify taxpayers who are incorrectly reporting property sales at the preferential capital gains tax rate, or who have been flipping properties for quick gain and should be reporting them as sale of inventory, or they have been aggressively claiming properties as their principal residences and avoiding paying taxes altogether. The CRA has always been concerned about construction workers not reporting all of their income which is why they piloted and maintain “Construction Teams” in the Tax Services Offices. The new information reporting requirement on form T5018, provides the CRA the ability to ensure the proper amount of tax is being paid by construction workers and frequent audits ensure payments to workers and amounts they reported fall in line as well. What was once considered a safe haven where wealthy investors could put monies out of reach of their governments has now become a bone of contention as investors want to pay as little tax as possible, governments want as much tax as possible – especially from these high net-worth people and the general public want the wealthy to pay more taxes! FATCA got the ball rolling and now the CRA has followed suit, seeking information of the investors before then taxing them back on their offshore accounts. Tax shelters, while shielding investors from paying tax on current income, likely will have to pay taxes at some point in time down the road as the CRA tightens the regulations on these investment tools to ensure they are not tax evading schemes. The CRA has its ears on the ground more than ever and the Canadian Border Services Agency (who used to be part of the Canada Customs and Revenue Agency) are locating and turning up illegal activity and the CRA is following up that criminal activity with assessments and re-assessments. Combine that with the Informant Leads line and you can quickly conclude that to the CRA crime does not pay, but criminals should pay taxes too. The CRA’s reach extends to the charitable sector as well. Both donors and registered charities are heavily scrutinized for potential fraud especially around those donating non-cash gifts. The CRA is looking to ensure that the amount reported on the donation receipt (and the corresponding credit claimed by the donor) accurately corresponds to the value of the donated item, and that the value is as close to fair market value as possible. 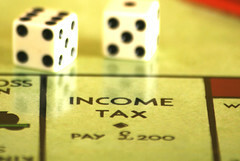 The CRA has been using these techniques for years to ensure taxpayers are paying their fair share on all sources of income and are doing so without increasing the number of employees dramatically which means a few things; First, it may be worthwhile to review your previous filings and – if errors are identified as a result of that review – take advantage of the voluntary disclosure program. Second, in the voluntary tax system we have in Canada, the onus is on you, the taxpayer to prove to the CRA that you are operating in line with CRA regulations which means keeping great records, having professional help and keeping receipts. Thirdly, if you are off-side with CRA regulations and want to know what may happen to you if you get caught, you should give us a call.